And, parents, do not provoke your children to anger, but bring them up in the discipline and instruction of the Lord. Honoring one’s parents is a core principle of Judeo-Christian tradition. It is the fifth commandment, and the first of the five commandments that govern how we are to live our lives with other people. In this reading, Paul repeats the traditional requirement that children honor their parents and augments it with the requirement that parents be loving guardians of their children. There are natural roles that must be fulfilled if the family is to thrive. The family must have leadership that offers direction and wisdom. The family must have providers who offer food and shelter. The family must have nurturers who supply love and support. The strong protect the weak, and the weak honor the strong. The family is held together by strength. 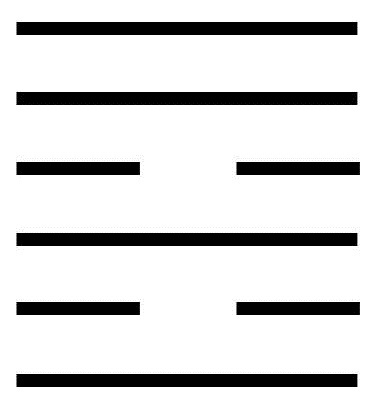 This is seen in the hexagram by the strong (solid) lines at the bottom and top positions. The remaining four lines are composed of two complementary line pairs. Each pair consists of one open line on the bottom and one closed line on the top. The pairs represent bonds within the family. One pair represents the bond between parents, and one pair represents the bond between parent and child. To honor the laws that govern family relationships and to project those laws out into the world. To recognize that the family is nurtured by love, faithfulness, and respect. To recognize the need for both authority and loyalty in the family. To feel the power of one’s words, just as a parent’s words have power on a child. To know that words have the most power when they are clearly related to the specific issue at hand and not based on generalities. To realize that words are only meaningful when they are supported by one’s own behavior. To temper authority with love and compassion. A moving line in the bottom position describes an ordered family in which everybody is treated with loving fairness and in which all members understand their roles. Children must be gently but firmly indoctrinated into the group so that they know the family rules, structure, and etiquette. Pampered children grow into conceited adolescents who can’t see beyond their own egocentric perspectives. It is much easier to teach good behavior from the beginning than it is to correct bad behavior once it is established. A moving line in the second position encourages the nurturer of the family. This nourishment is both literal (food) and metaphorical (spiritual). This person plays a critically important role for the family and provides a social and religious focus for the family. A true nurturer does not cajole others, but influences by providing loving attention to each person’s physical, spiritual, and psychological needs. A moving line in the third position warns us not to err on the side of strictness and force. Although the family needs structure (and this structure should never be neglected), it should be a structure that accommodates and even encourages individual exploration and growth. If one must err, it is better to err on the side of strictness rather than latitude. A moving line in the fourth position encourages the steward of the family. The steward is the one who is responsible for ensuring that expenses are balanced with income. The steward ensures that resources are not wasted, but used in a way that truly benefits the family. In the public sphere, a similar function provides for the general welfare. A moving line in the fifth position encourages the wisdom bearer of the family. The wisdom bearer is the one in the family who is best able to set aside Ego and be guided by Wisdom. The wisdom bearer must have a character that is honored and respected. The relationship between the wisdom bearer and the rest of the family is never based on fear, but only on love and trust. A moving line in the top position encourages the leader of the family. The personality of the leader sets the personality of the family, so it is especially important that the leader be one who is guided by inner truth. The leader must be one who willingly takes on the burden of responsibility and understands the difference between responsibility and power.